She’s back! After a long stint in Puerto Vallarta, Sutton Lee Seymour returns to the Laurie Beechman in her newest night of comedy and song in Fame-ish. Paying homage to the Great White Way, Sutton Lee Seymour is a rude and crude, dynamite performer unlike anyone you’ve seen before. Back with a crowd of people who get her without prodding, Sutton Lee Seymour is in her element. Keeping the night in line with that infamous street only a few blocks away, she starts the night off with a bang with a slight parody of “A Musical” from Something Rotten. And then she’s off to the races. And this is a high-octane performance. 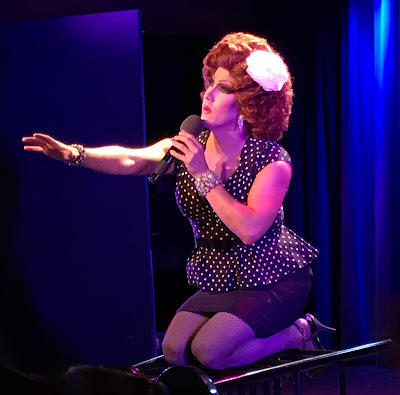 But be warned, if you have performance anxiety, Sutton Lee will find you and drag you on stage because this queen likes a little audience participation. Actually a lot. If you’re already a fan of her performance, you know her innate ability to transform from her drag persona and into an array of parody characters. Her musical theater sensibility transcends the genre, falling back to her roots. As a Camp Queen of Stage and Screen, Sutton Lee Seymour has the intellect to destroy classic musicals, like Wicked and Chicago, and perform them in 5 minutes, parodying to oblivion. She even does a mash-up parody of “Titanic” in the spirit of Grease. By performing routines like this, she has the audience eating out of the palm of her hand. The jokes are easy but it gets the audience roaring. Even in her moments of banter, her stories are hilarious. Whether it’s anecdote about an epic flop moment in West Side Story or throwing immense shade to a Drag Race queen for spinning into a costume reveal and ending up on the show, she knows how to get a crowd to laugh. It’s a trait that, shockingly, is rare for some drag queens. If you’ve seen her multiple times or this is your first time a Sutton Lee Seymour show, she makes sure that you feel welcome and a part of her family. She may call her show Fame-ish, but she is well on her way to be famous.